There are many reasons why people should recycle. Most of them are simple common sense, but for those who need a bit more prodding, this article will focus on the 7 most important reasons why you should start. Did you know that recycling helps to reduce carbon emissions, otherwise known as greenhouse gasses? Whatever your stance is on the issue of global warming,î most people agree that we all need to do our part to lessen the impact of pollution and carbon emissions. Companies that use recycled aluminum save 95% energy in the production of new aluminum products compared to companies that use raw materials. For every ton of paper that is recycled, 17 whole trees are saved. This doesn’t just save energy, it helps to combat carbon gas emissions because each tree can remove as much as 250 pounds of CO2 from the air each year. Our landfills are overflowing at an alarming rate and we are quickly running out of space. Cities that are near the ocean have been dumping trash into the water for decades, but our oceans can no longer support this dangerous practice. As much as 60-75% of the garbage that is in our country’s landfills could actually be recycled. What that means is that if everyone took the time to recycle, we would need 60-75% less land space for garbage in the future. Did you know that the garbage that is in landfills can affect the local groundwater? Most landfills do not treat the garbage in anyway, they just throw it into a big hole and bury it underground. Much of the trash that is thrown in the landfill is not biodegradable or environmentally-friendly, and the contaminants that are found in this material can get into our water supply. This happens when rain or other runoff water from landfills makes its way into ponds, rivers, lakes or streams. It not only damages our already fragile ecosystems, but it makes this once fresh water supply dangerous to drink or use. It is no longer safe to drink from these waterways today when you are out camping or hiking – even in remote areas. When companies choose to use recycled materials that come from paper products, plastics and metals instead of using raw materials, they reduce the amount of toxins that are released in the air. When these materials are processed in their raw form, they add a significant amount of carbon emissions into the air. Individuals who recycle these materials make it easier for companies to purchase quality recycled products to use in their factories. Did you know that it takes twice as much energy to burn plastic as it does to recycle it? It also takes 64% more energy to make paper than it does to recycle and reuse it. Scientists have shown that by just recycling one pound of steel enough energy can be saved to run a 60-watt bulb for a whole day. It might not sound like a lot, but it all adds up. One of the best way to increase your property value is to recycle. Communities that recycle reduce the need for landfills. Landfills lower property values because nobody wants to live near a smelly garbage dump. The more you and your neighbors recycle, the fewer number of landfills your city will need. The little bit of effort it takes to separate and recycle your trash each week will eventually pay off for everyone in the community. Homeowners aren’t the only ones that benefit from recycling. Processing plants and industrial factories can save a lot of money on energy and material costs by using recycled materials instead of raw, natural resources. 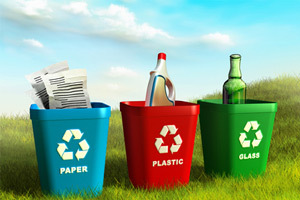 Recycling can also help to reduce solid waste costs and can become a regular stream of added revenue when scrap metals, plastics and other materials are recycled on a regular basis. A lot of people think that one person can’t make a difference, but in the case of recycling, one person can make all the difference. On average, each American produces approximately 1600 pounds of waste each year. As much as 1100 pounds of waste could be recycled each year per person – that’s over half a ton just for one person! A family of four could reduce waste by over two tons in a year – just by the simple act of recycling. You don’t need to be a “tree-hugger” or environmental activist to recycle. Recycling is for everyone and it’s so easy, a kid could do it. It’s more than just common sense, it’s a simple way to preserve our natural resources and protect our clean air and water. For more information on recycling programs and resources available in the Southern New England area, visit Mid-City Scrap Iron & Salvage at www.midcityscrap.com for details. With services available for local residents, municipalities, independent contractors and large businesses, Mid-City Scrap makes it possible for everyone to do their part.